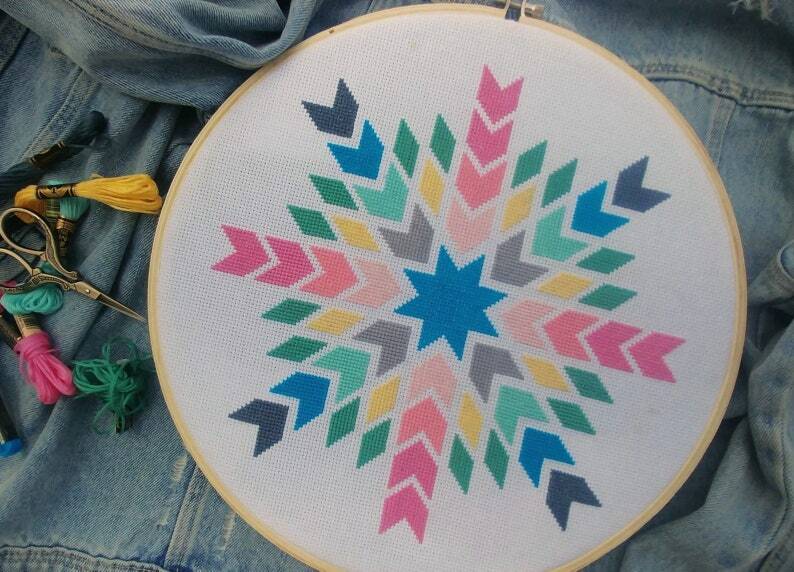 Roxie Star Barn Quilt Boho Cross Stitch Pattern. This is my most popular design and sweet and lovely. This is a fairly easy stitch, but is a larger piece. I love that I have a full piece of art when it is hanging on the wall! I you want a different color scheme with a different design.....let me know! I can create something for you! -Full-color PDF cross stitch pattern ..... a full pattern and a large pattern. Finished size of pattern: 10.0" wide x 10.0" tall. Pictured framed in a 12 inch hoop or in a 12" x 12" frame. Be sure to check out all of my Barn Quilt patterns! New ones being designed all the time! Give as a gift or keep it for yourself! *Please note: I work hard to come up with color combinations for my designs. I personally stitch different threads to make sure all the colors work together. If you would like, I would be happy to take "extra" pics of a sampling of colors for you. That way, you can make sure the design matches the colors you love. Just let me know! Love it! This is so cute, it matches perfectly with the boho decor in my bedroom.